Onederland or Bust! : Strawberries and my first 5k Race! I don't think I've felt this good on a monday morning in a long time! After berry picking I headed over to pick up my race kit for sunday then rushed back home to meet up with my boyfriend and some of his friends from work. Saturday started off with a lovely breakfast of waffles and strawberries. Yum! Let me start by saying that a potluck dinner the night before isn't the way to go lol. The food wasn't greasy or too different from my usual diet, but I ate much later in the evening than I'm used to and I wasn't all the hungry... so my dinner sat with me well into the night. I remember waking up in the middle of the night not feeling so well. That mixed with nerves had me going to the washroom a few times before the race started at 8:45 am. I was slightly worried that I was going to suffer from runners trots during the run (luckily I didn't!). I had a 40 minutes drive to get to the race, so I turned on the radio, drank a bottle of water and ate a cliff bar to give me some energy. I was going to stay at my sisters the night before so I didn't have to get up at 6:30am, but I figured the drive would give me some time to relax... which it did! I picked up my sister around 7:50, had another bathroom break then headed downtown. Once we were at the race location, I promptly found the washroom again then found my way to the starting line. While standing in line I could feel a small rock in my shoe so I took my shoe off and gave it a shake. A few minutes later, the whistle went off and away we went. After a few minutes I realized that the rock was still there and I noticed it the entire way (there was no way I was stopping at that point to take it out). The race started on top of a pretty large and steep hill so I picked up momentum right away. It was nice to have a little push start, but it threw off my breathing because it wasn't my usual running pace. I was happy to see that there were a lot of people doing a run/walk combo so I had a good feeling that I wouldn't be last. The first 2.5km felt long, but I didn't stop. I was relieved to see the turn around station because I knew that I was half way there. Unfortunately the turn around station was up a small hill and at that point I just had to slow down and walk for a minute. My downfall when running is stopping to walk because I always find it so hard to get a steady running pace afterwards. Anyway, the way back went by pretty quick, but I did have to stop and walk a few times. I mentioned that the race started on top of a hill, well obviously this means that the last 50-100 meters were running UP this steep hill. Holy crap I wanted to die lol. I jogged up the first half of the hill then had to stop and walk. At this point I was only half way up the hill, but I could see the finish line. There was no way that I was going to walk through the finish line so I pushed myself and slowly made my way up to the top. 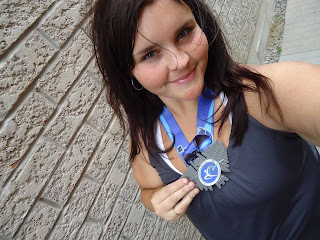 I crossed the finish line and seriously thought I was going to puke! Here's a picture of the hill. The picture doesn't do it justice, but you can tell that it was a good, steady incline. The finish line was near that weird looking statue at the top. A couple hours after the run :) Isn't the metal nice!? I posted the last picture on Facebook and received so many congratulation notes, it felt great. When I crossed the finish line I quickly noticed the digital timer, which read 53 minutes. That was a little discouraging. I knew I was slow, but I didn't think I was THAT slow. However, this morning my boss (who ran the half marathon) went online to check our official times and it turns out my time was 38:33!! That seriously made my day! I came 155 out of 186... not too bad! I just wanted to thank you all for your amazing support!! 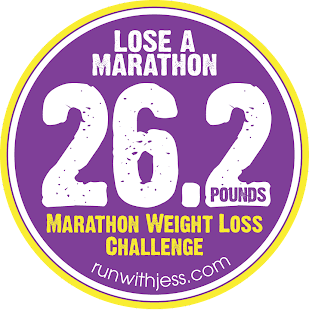 I was really bummed and discouraged when I found out I'd be running alone and if it wasn't for all your encouraging comments, I likely would've bailed on the race. So thank you, thank you, THANK YOU!! :) I'm so glad to be writing such a positive race recap this morning. Congrats on your first race! GREAT time too! You should be very proud. I hope you recover quickly!! Those strawberries look delicious! I love when it is strawberry season! They are simply divine! Congrats on your race!! That is something to be so proud of! They were so good! I made chocolate covered ones for the party on saturday too! Awesome job!! I'm so glad to hear it went well for you - thinking ahead to another race is always a good sign!! Congratulations!!! I'm beyond excited for you. Running a race is a huge accomplishment and milestone and youve done it! Btw you look amazing for having finished a race haha, I always look like a blotchy red tomato or something lol. P.s. - way to cross something off your summer bucket list as well! I saw one of my actual race pictures taken by the race photographer... oh my, you'd be glad to know that it is not pretty! ha! Congratulations!! What a great accomplishment and I'm glad you had such a positive experience.